Electronic Density Of States object. Any ASE compliant calculator object. Width of guassian smearing. Use width=0.0 for linear tetrahedron interpolation. Use window=(emin, emax). If not specified, a window big enough to hold all the eigenvalues will be used. Get array of DOS values. The spin argument can be 0 or 1 (spin up or down) - if not specified, the total DOS is returned. Return the array of energies used to sample the DOS. The energies are reported relative to the Fermi level. DOS from linear tetrahedron interpolation. Eigenvalues on a Monkhorst-Pack grid (not reduced). 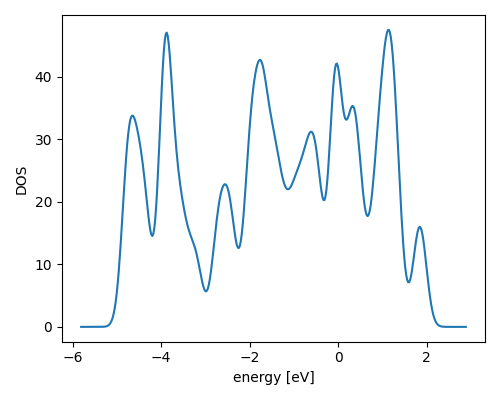 Energies where the DOS is calculated (must be a uniform grid). Return the moment of nth order of distribution. 1st and 2nd order moments of a band correspond to the band’s center and width respectively. For integration, the trapezoid rule is used.